The Apollo that started it all, now called the Apollo Silver or Apollo FireWire. UA had kindly sent me a Thunderbolt I/O expansion card for the Apollo, which was a breeze to install. Then my troubles began. Neither of my Macs would see the Apollo no matter what I did. The UA control panel and Console software returned a "No Devices Found" error message. I reckoned the Apollo might need a firmware update to recognize its own Thunderbolt card, and delving into the support knowledge base on UA's site confirmed that. The problem was, I couldn't get either machine to recognize the presence of the Apollo over Thunderbolt, even though I had installed the latest UAD software (version 9.4.0 as of this writing) -- not even to the extent that it would prompt me to update the firmware. Just that "No Devices Found" message again. More research of UA's support documents sent me down numerous rabbit holes, all to no avail. 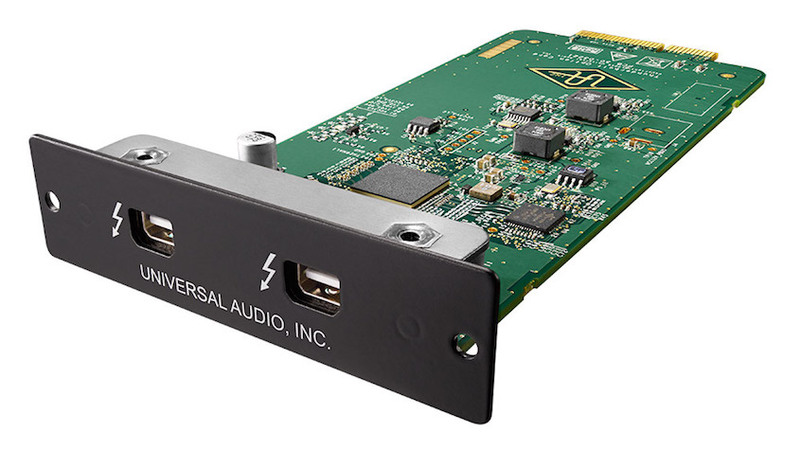 UA's Thunderbolt 2 card is easily slotted in to the back of their original Apollo interface, which used FireWire 800. Go drop $29 on an Apple Thunderbolt-to-FireWire adaptor. If you have a an even more recent machine than mine that delivers Thunderbolt exclusively over USB-C ports, you'll likely need a more costly solution such as this dock from OWC because purpose-built USB-C- to-FW800 adapters are scarce if not nonexistent. Alternatively, if you have an older machine that has one or more FireWire 800 ports and it's still in use, you can do the first half of the update from there. The point here is that the Apollo uses one of its own FireWire 800 ports, inititially, to see the connected Mac. Go to Universal Audio's downloads page to get the latest software. If you're not logged into your account, you will be prompted to do so when you click a download link. Download that software. At this point, for good measure, I shut down the computer and powered down my Apollo interface. After waiting 30 seconds, I powered up the Apollo first, the rebooted the Mac. Click on the package file you got from expanding the ZIP file. Follow all instructions to install the latest UAD software. Make sure "Apollo software" is checked when you're presented with options. If the "UAD Meter & Control Panel Software" has not launched automatically at the end of your installation, launch it. It should be in the applications folder. At this point, the UAD software should show you a dialogue box that says you need a firmware update. Click as instructed to proceed. Now, don't power anything off or let it go to sleep. When the install has completed and you have confirmed, power everything down. Reconnect the "silver" Apollo directly from one of the Thunderbolt ports in its installed option card, to the computer. Again, if you have a recent mac that only has USB-C ports, this may involve yet another adaptor, such as this. Power up the Apollo first, then the computer. Launch the UAD software again. That's right. If you really want to be OCD, re-install the whole software bundle from the package file before launching. The UAD software, when launched, will likely prompt you to do yet another firmware update. This time, it will occur over your Thunderbolt connection. Proceed as before. After another restart, your Mac should now be talking amiably with your "silver" Apollo over Thunderbolt, and all the "Powered Plug-Ins" in your account should be available for use in the Console software and in your compatible DAW of choice. That is what worked for me, and to make full disclosure, how to do so with a USB-C-only Mac was extrapolated, not tested. However, it really does seem like the key initial step is for the Apollo to see its first firmware update over the FireWire port it's accustomed to using, and that that update then tells it to look for the Thunderbolt ports. I can vouch that installing the Thunderbolt expansion card does not make the ports "go live" automatically. I hope this will be of use to whatever owners of the original Apollo have upgraded their Macs before their audio interface and found themselves in these "perfect storm" circumstances. Of course, let me know via comments or email if this does or doesn't work for you, and we'll make refinements if necessary.